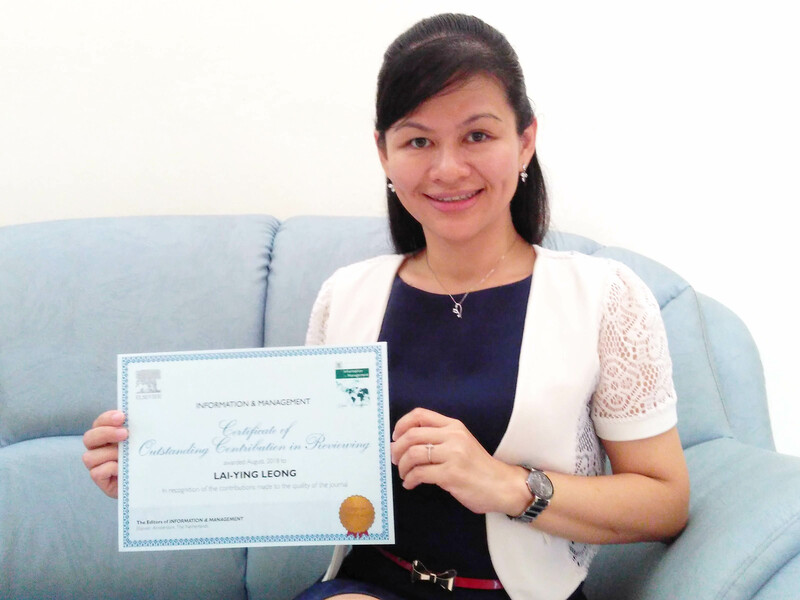 Faculty of Business and Finance Academic Dr Leong Lai Ying was recently awarded the “Certificate of Outstanding Contribution in Reviewing” by the editors of Information & Management Journal. The outstanding reviewer award serves as recognition for reviewer within the top 10th percentile of reviewers for the Journal in terms of the number of manuscript reviews completed in the last two years and for Information & Management, it means a minimum of two manuscript reviews in two years. Editors can also personally select and recognise reviewers who have submitted high-quality reports and award them with a certificate of excellence. “As an active reviewer, I am blessed to be given this award and it is certainly a boost of confidence to myself, especially in reviewing manuscripts from high ranking journals. I believe with this confidence, I would gain more forte in commenting constructively and further enhancing my quality of reviews,” enthused Dr Leong. Reviewing of manuscripts from researchers such as Dr Leong is all part of the effort to evaluate the degree of originality, significance of contribution, as well as to identify any flaws or weaknesses that needed to be appropriately addressed. Her role as a reviewer also holds significance in ensuring that the articles accepted for publications are reflecting the latest topics and trends of study. The reviewing is double-blinded, meaning the reviewers and authors remain anonymous for fair evaluation, and enables the reviewer to freely comment in hope to enhance the overall quality of the article. “The quality of manuscript that has gone through the journal reviewing process will normally be better than the first submission because authors will have enhanced the manuscripts based on the comments and recommendations they received from the reviewers. In addition to that, journal reviewing is important because it also serves as a filtering process to eliminate poor quality manuscripts that do not meet the standards of the journals,” explained Dr Leong. Information & Management is published by Elsevier, Amsterdam, The Netherlands. The journal is indexed in Thomson Reuter’s (ISI) Science Citation Index (SCI) and Social Science Citation Index (SSCI) with the 2017 impact factor of 3.890 and a five-year impact factor of 4.792. It is an A* ranking journal by Australian Business Deans Council (ABDC) Journal Rankings 2018 List as well as an A* ranking by the Australian Council of Professors and Heads of Information Systems. Information & Management is also included in the “A+” list of the Department of Information System, Faculty of Commerce, University of Cape Town together with other top IS journals such as Decision Support Systems, Information Systems Journal, Journal of Management Information Systems, European Journal of Information Systems, Communications of the ACM, Information Systems Research, MIS Quarterly, etc.